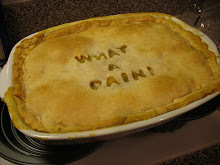 Gollum's hosting a Pot Luck on her fun blog, Designs by Gollum...She said we could bring whatever we want! I didn't want to make Corned Beef tonight. Corned Beef isn't Irish anyway, it is American. In Ireland they didn't have it..but I always make it for the 17th, and hash with the leftovers.. 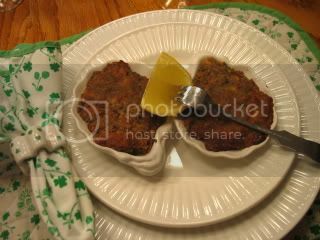 So come sit down, for a simple weekday night dinner..
First we'll have some baked clams...Ireland is surrounded by water, just like where I live..
Then some Irish Flag Soup...because it has the colors of the flag..there's parsley in there for the green..and potatoes of course! 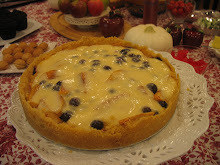 I don't think there is any such thing, but this is my mom's recipe and she was Irish American , so close enough...I can't give the recipe till Mother's Day, when Foley will host a special tribute on her blog..you'll all be invited..start looking for some recipes passed down from your mom or grandmother...it will be lovely! 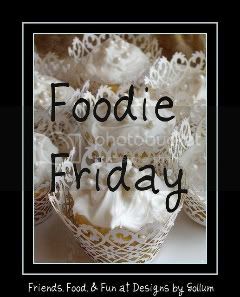 Thanks for the reminder it is Foodie Friday! I'll be wearing the green on the 17th. What a great tablesetting and the food sounds really good as well. The Irish surely like their potatoes! What a darling china pattern! 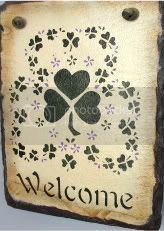 I love it, and you would know that a shamrock pattern would be Irish! :-) Thanks for showing us because I like to know about plates as much as I do the things that go on them! And I'm fascinated to know that corned beef isn't Irish but rather, Irish American. Never would have guessed that. 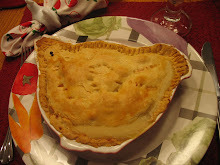 Happy Foodie Friday and St. Patrick's Day, too! 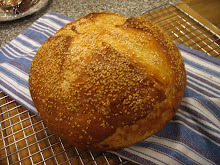 Kathleen, I knew this would be another delicious and pretty post. Everything looks great! Rice pudding, yum! Kathleen, this is such a great post. I can hardly type after trying to follow those fast talking (I mean singing) Irish lads :) I love the shamrock dishes from Ireland and the cabbage bowls look so nice with them. M is so lucky to sit down to such a beautiful table and great food every night! I can't wait to join the party on Tuesday! 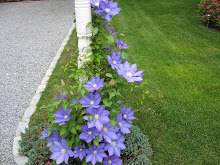 Beautiful post Kathleen. The table is lovely and the food looks delicious. 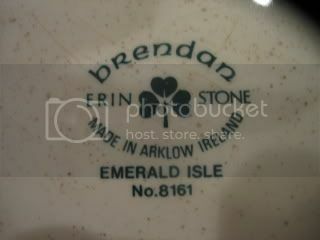 You're so goldang Irish, even your china was made in Ireland. 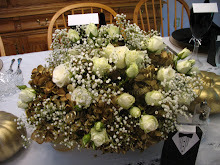 And you continue to be the reigning queen of beautifully-classic table arrangements. 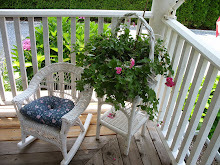 Aunt Martha would be green with envy. Can't wait to check out the recipes. 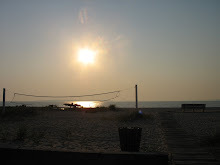 Have a great weekend, Kathleen! What a wonderful post, Kathleen..... 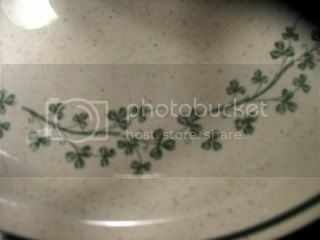 Your Irish plates are so sweet. 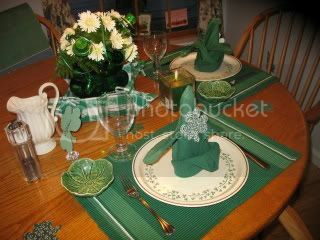 Love all the details of your tablesetting. How sweet of Susan to send you the cabbage bowls. Clams, soup, and pudding ... sounds like a wonderful dinner. I enjoyed listening to Johnny McEldoo while typing up my comments. I having a wee bit of a problem with the words to the song but you can bet I'll be here for the party. Can I just hum along ? I love all the shades of green on your table ;) and I love rice pudding. 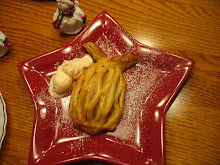 My mother used to make it when I was a little girl. I can't wait for your mother's recipe too! 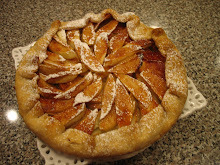 I love your dishes - the simplicity of them is perfect. The little cabbage bowls I have never seen that size..I'll have to be on the outlook for them! 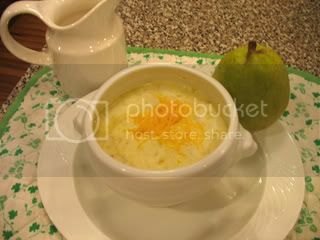 Rice pudding used to be a speciality of my Grandma..I don't think I have had it since she passed away years ago! Wow, that sounds like fun! Such a yummy post! Very yummy! Thanks for sharing and Happy Friday! I'll be able to sing it much better after some Bushmill's and Bailey's! 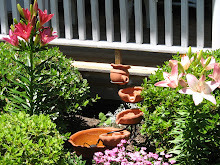 Great post, Kathleen! Looking forward to the big party! Pretty table. Your Irish dishes are so lovely, and those cabbage bowls go perfectly. The food looks soooo good! My mother used to make Rice Pudding..and that was always a treat. You always set such a pretty table and at this time of the year I'm amazed at the variety you can pull out of your hat (or pot of gold). I love Brenday..I don't remember seeing it before. 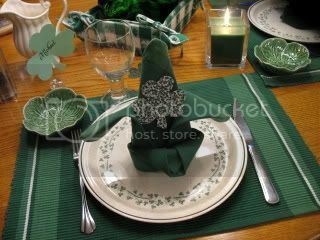 And you shamrock napkins! 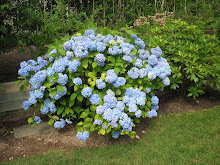 I'm enjoying your blog so much, it's my first time here. The table settings are wonderful and I can't wait to try the Recession Quiche. Everythings got to taste wonderful on those pretty Irish plates! 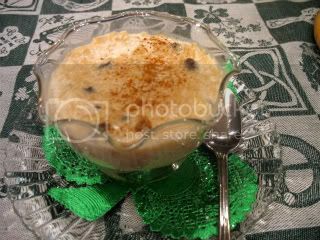 Rice pudding is a favorite of mine! 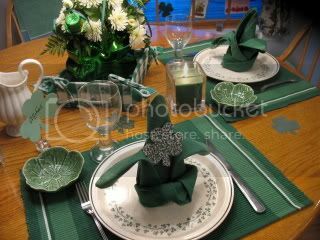 Love your shamrock plates and also the cabbage leaf bowls. Great tablesetting! Okay, this is another cute tablescape by YOU. The food also looks soooo good!